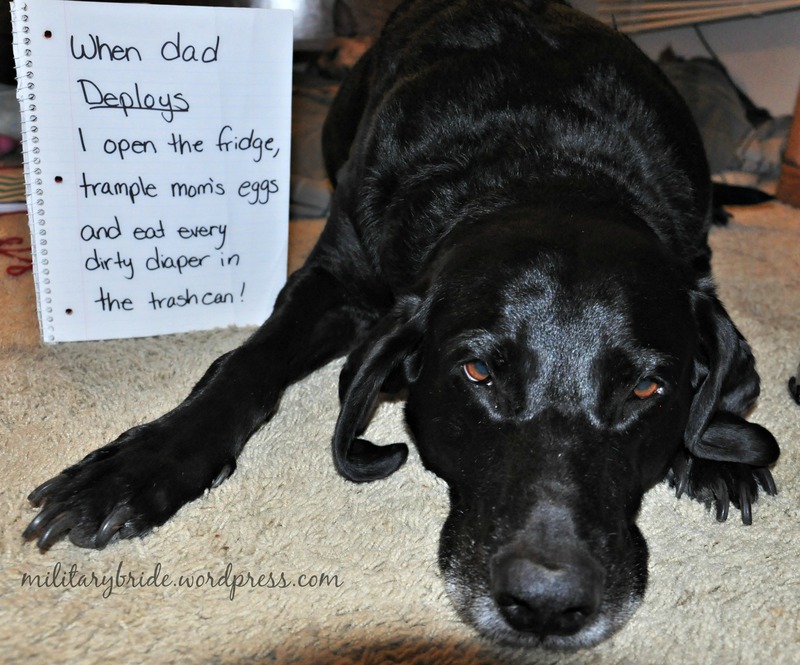 Dog Shaming… I had hoped to never have to do this. As you know by now, I have one incredibly smart blacklab/weimaraner. This is Blackjack, and since daddy has been deployed, he has been a royal plain. People always laugh when they see the dog shaming posts, heck I’m guilty of laughing too. Until its your dog. Blackjack has always been a handful. We can’t put him in a kennel because it takes less than a half an hour to escape every type of kennel there is. I can’t leave him unsupervised in the back yard because he will open the latch and take himself for a walk…. actually I can’t leave him unsupervised anywhere. He’s opened more doors (including firedoors) than any dog should ever be able to. Whenever we have company they are always amazed when he pops the back door open in two seconds flat, and just lets himself out. They think it’s the greatest trick ever, I know better. When my husband was in bootcamp (before I met him), he left this dear sweet dog with his aunt. That poor aunt has had to replace most of her furniture and do a little bit of redecorating because of this guy here. By the time I married my husband, Blackjack was three years old, and way way to smart for his own good. The first deployment started okay, until he figured out how to open the fridge. I chalked it up as a fluke and cleaned up the mess. A month or two later, I had tried every child lock available for kids and dogs. Then I started barricading the fridge. Just to leave the house I would put all of the kitchen chairs in front of it. It worked well enough to get through deployment. Over the years he’s just gotten worse. He’s eight years old and the only thing we have found that works is a muzzle. I’m not a huge fan of muzzles. I always associated them with dogs who are aggressive, or who might bite you. I didn’t realize it would be the only that kept my dog from eating the trash, or opening the fridge and trampling all of my eggs!!! Most dogs calm down when they hit eight…. not ours. He has just become more stubborn and determined. You know what? I should have put this dog in the movies. We would have made enough to be comfortable, that’s for sure. Posted in Uncategorized and tagged black lab, blackjack, dogs, dogs getting into trash, family life, military family, smart dogs, weimaraner. Bookmark the permalink.